Across 38 nations polled by Pew Research Center, a median of 42% say the U.S. is the world’s leading economy, while 32% name China. Across all of the countries surveyed in Latin America, as well as most in Asia and sub-Saharan Africa, publics tend to believe the U.S. is the top economy. And by a 51%-35% margin, Americans name their own country rather than China. But in seven of the 10 European Union nations in the study, China is considered the leading economic power (it is tied with the U.S. for the top spot in Italy). A plurality in Russia also holds this view. And China leads the U.S. by a two-to-one margin in Australia – a longtime U.S. ally, but also a country whose top trading partner, by far, is China. Over the past year, perceptions of relative U.S. economic power have declined in many of America’s key trading partners and allies. The trend can be seen in several European countries, where views about the economic balance of power have fluctuated in recent years. Following the onset of the financial crisis nearly a decade ago, Europeans increasingly named China, rather than the U.S., as the world’s leading economic power. But in recent years, as the American economy slowly recovered, the pendulum began to swing back in the direction of the U.S. This year, however, the pattern has reversed itself again, and in countries such as Germany, the United Kingdom and Spain, China is once more seen as occupying the top spot. But these shifts are not limited to Europe; perceptions have also changed significantly in countries such as Canada, Brazil, Mexico and the Philippines. One thing that China and the U.S. share is that leaders of both countries are currently viewed negatively around much of the world. A median of 53% say they do not have confidence in Chinese President Xi Jinping to do the right thing in world affairs. Still, a much greater share (74%) express little or no confidence in U.S. President Donald Trump. 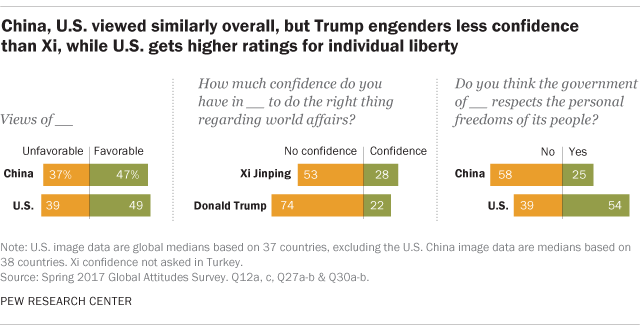 Xi is less well-known globally than Trump, however: Roughly one-in-five do not have an opinion of the Chinese leader, while only a median of 8% have no opinion about Trump. Regionally, China receives its most positive ratings in sub-Saharan Africa, where it has invested heavily in recent years. At 72%, Nigerians’ assessment of China is the most positive on the survey. The only other country where at least seven-in-ten express a favorable opinion is Russia (70%). 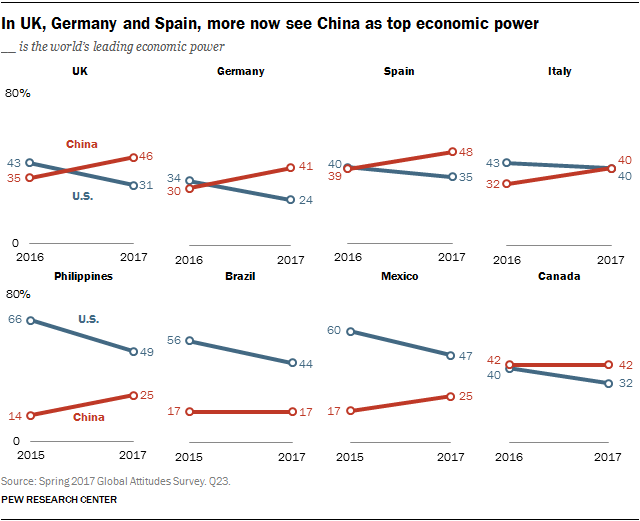 While Europeans are divided on China, the share of the public with a positive view has nonetheless increased significantly in some countries, including Spain, France and the UK. Opinions have moved in the opposite direction in several major Asian nations, with a particularly steep decline in South Korea. Drops in Indonesia, India and Vietnam were also significant. One issue on which America has a much stronger global image than China is individual liberty. Across the nations polled, a median of 54% say they believe the U.S. government respects the personal freedoms of its people. Just 25% say this about the Chinese government. These are among the major findings from a new Pew Research Center survey conducted among 41,953 respondents in 38 countries from Feb. 16 to May 8, 2017. A median of 47% across the 38 countries surveyed have a favorable opinion of China, while 37% express an unfavorable view. Majorities or pluralities in 24 countries give China a positive rating. The most favorable views of China are found in sub-Saharan Africa – a region where China has invested heavily in infrastructure and development. Positive opinions surpass negative ones by a more than four-to-one margin in Nigeria, Senegal and Tanzania. In Ghana, 49% have a positive image of China, down 31 percentage points since spring 2015. This may be due, at least in part, to recent frictions between the two countries over mining practices in Ghana. In Latin America, positive sentiment toward China is highest in Peru. Roughly half in Brazil, Venezuela and Chile also have positive feelings about the Asian economic giant. Russians are also positively inclined toward China, with seven-in-ten expressing favorable views of their neighbor. In fact, Russia has the second-most positive opinion of China, after Nigeria. In the United States and Canada, publics have mixed views of China. Canadians are favorably inclined toward China by a 48% to 40% margin, while Americans lean in the opposite direction (47% negative vs. 44% positive). U.S. attitudes toward China have softened since 2016, when 55% had an unfavorable view of the Asian power. There are significant partisan differences in the U.S., with Republicans more likely to have negative views of China (56%) than Democrats (41%). In the Asia/Pacific region, opinion is mixed. Favorable opinion of China ranges from a high of 64% in Australia to a low of 10% in Vietnam. In Australia, positive views of China have increased 12 percentage points in just the past year (as favorable views of the U.S. have declined 12 points). But favorable opinions of China have also fallen over the past two years in Vietnam (-9 points) and Indonesia (-8). The decline is particularly notable in South Korea, where favorability of China has fallen 27 points since spring 2015 and now hovers near historic lows. 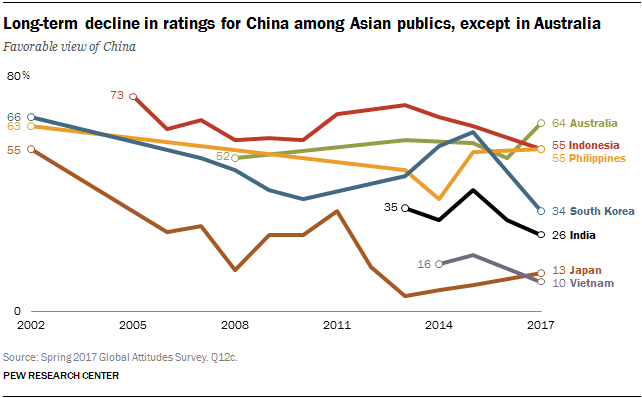 Additionally, China’s ratings have slowly declined in most Asian countries surveyed. For example, 55% in Japan had a positive rating of their Asian neighbor in 2002, but now only 13% do, despite a rise in Japan in favorability towards China after the 2011 earthquake and tsunami. In some countries surveyed, the youngest generation of adults is more favorable toward China than their elders. The largest difference between young and old on views of China is found in the UK, where 62% of young Brits (18- to 29-year-olds) have a favorable view of China, compared with only 38% among those ages 50 and older. While the difference is largest in the UK, other countries display similar patterns, with age gaps of 15 percentage points or more in Australia (+20), Canada (+17), Russia (+16), the Netherlands (+16), France (+16) and the U.S. (+15). While China’s global image is largely positive, the same is not true of its leader, President Xi Jinping. A global median of 53% say they have little or no confidence in him to do the right thing in world affairs, compared with 28% who do have confidence in Xi. In only five countries do more than half express confidence in Xi. Three – Tanzania, Nigeria and Senegal – are in sub-Saharan Africa. The Chinese president also gets high ratings in Russia and the Philippines, where views of him have not changed much since Rodrigo Duterte became president in 2016. Xi is viewed negatively in the U.S., as well as in the European nations surveyed. He also receives poor reviews in neighboring Japan and Vietnam. In several countries, across several different regions, a large share of the public offers no opinion about Xi. “Don’t know” responses are especially common in India, Tunisia, Poland, Hungary, Argentina, Indonesia and Senegal. A median of 58% across 38 countries believe that the Chinese government does not respect the personal freedoms of its people. This view is especially prominent in Europe, the U.S. and Canada. 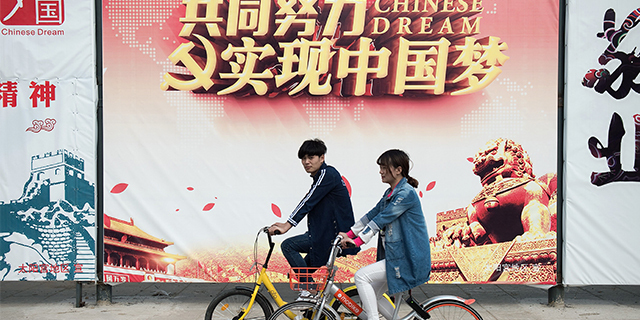 Roughly eight-in-ten or more Swedes, French, Germans, Dutch, Americans and Canadians say China does not protect its citizens’ personal freedoms. The view of the Chinese government as a violator of civil liberties does not hold across all regions, however. More than half in the Middle East (55%) and sub-Saharan Africa (53%) say that China does respect the personal freedoms of its people, a stark difference from the views of those in the West. China’s reputation for defending the rights of its citizens is particularly strong in sub-Saharan Africa. In all but South Africa, half or more say that Beijing respects the personal freedoms of its people. And in South Africa, a plurality (46%) agrees. Within its own region, assessments of China’s record vary. A majority of Indonesians (56%) and roughly half in the Philippines (52%) say that China respects the personal freedoms of its people. Meanwhile, Japanese (85%), Australians (81%) and South Koreans (77%) are as negative as publics in Europe and North America in views of the Chinese government’s protection of individual rights. While views on this question have remained relatively consistent across most countries, opinions in the Philippines, Jordan and Russia have shifted in recent years. Views of China as a protector of personal freedoms have risen among Filipinos since 2014. In addition, for the first time since the question was initially asked in 2008, majorities in Russia (56%) and Jordan (55%), where Xi has made efforts to improve bilateral relations, say that the Chinese government respects the personal freedoms of its people. 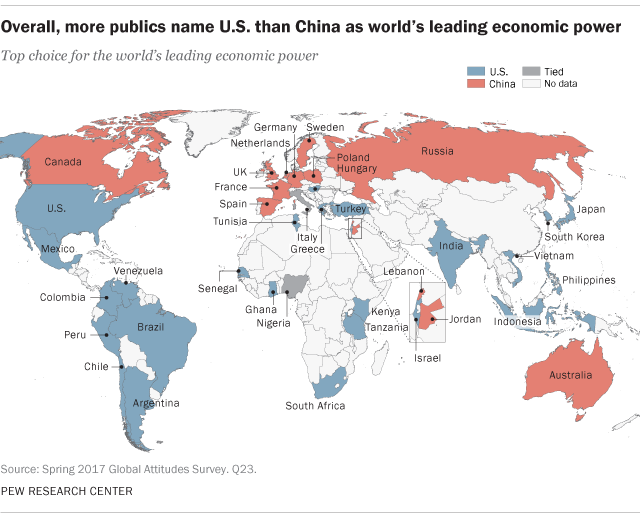 Survey respondents were asked which is the world’s leading economic power: the U.S., China, the countries of the EU, or Japan. In 24 of the 38 countries surveyed, most see the United States as the global economic leader. China, meanwhile, is named the world’s top economy in 12 countries, double the number of nations who saw China in the economic lead when the question was last asked in the same countries between 2014 and 2016. Among the 38 countries surveyed, South Korea is the most likely to say that the U.S. is the leading economic power (66%), followed closely by Japan (62%). Roughly half say the U.S. is the world’s economic leader in Israel (52%), Vietnam (51%), Hungary (51%) and the U.S. itself (51%). In other countries in the Asia-Pacific region, views of the leading economy also still tilt decidedly toward the U.S. Pluralities in the Philippines (49%), India (42%) and Indonesia (39%) say the U.S. is the leading economic power. In Western Europe, people tend to say that China, and not the U.S., is the global economic leader. For example, pluralities in Spain (48%), France (47%), the UK (46%) and Germany (41%) say that China is the top economy. Australia is the country most convinced that China is the world’s leading economic power – 58% of Australians hold this view. Other countries in which pluralities say China sits atop the global economy include Canada (42%) and Russia (35%). While few overall say that the EU or Japan is the world’s leading economic power, a quarter in Germany cite the EU countries. 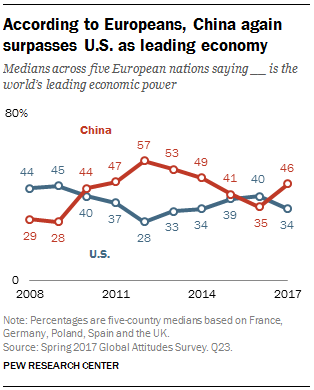 In 2017, a global median of 42% across the 38 countries say that the U.S. is the leading economy, with 32% naming China, 9% the EU, and 7% Japan. Since this question was last asked in these same 38 countries, fewer people say that the U.S. is the leading economy, while there have been slight increases in those naming China and the European Union. In Europe especially, there has been a movement back to naming China as the world’s leading economy. Before the Great Recession, across five European countries, people were more inclined to name the U.S. as the economic leader, but after the start of the crash, these five European publics named China as the leader. In the past few years, with the U.S. economy picking up steam and China’s growth somewhat slowing, the U.S. managed to once again be seen as the world’s leading economy across Europe. But since last year, the balance of opinion in Europe has again shifted toward the view that China is the world’s leading economy. Over the past few years, most of the steepest drops in views of the U.S. as the economic leader were in Africa and Latin America. For example in Tanzania in 2015, 63% said the U.S. was the economic leader, but that has fallen to 43% today. Similar double-digit drops occurred in Senegal (-20 points) and Ghana (-16). There have also been big declines in Mexico (-13), Chile (-12) and Brazil (-12), even though most in these countries still say the U.S. is the world’s top economy. In the Philippines, only 49% name the U.S. as the leading economic power, compared with 66% who said this in 2015. Still, only a quarter name China as the world’s leading economy today. And in the UK, 31% say the U.S. is the economic leader in 2017, compared with 43% in 2016. By contrast, in South Korea, more now say that the U.S. is the leading economic power than did in 2015.